Vital Energi's 10-year partnership with Berkeley Homes and SSE on the Royal Arsenal Riverside development has resulted in a finalist spot on the H&V News Awards 2017 shortlist, which celebrates the best projects in the sustainable and renewable energy sector. Royal Arsenal Riverside has been shortlisted in the District Heating Project of the Year category, which we are proud to have won in both 2015 and 2016. The heat created from the energy centre is distributed through a 3.5km district heating network which connects over 20 buildings. This network was designed to be “future proofed” to allow for easy expansion and the connection of more buildings over the 25-year construction period. Rob Callaghan, Regional Director for Vital Energi commented, “We are extremely proud to have played a part in the 350 year history of Royal Arsenal Riverside by delivering the energy centre and district heating network and would like to congratulate our clients who have always been 100% committed to creating a truly sustainable community which is bringing much needed homes to London.” Construction on the The Royal Arsenal Riverside development is set to continue until 2032 and, when complete, will serve 3,700 homes as well as shops, offices and leisure facilities across the 76 acre site. The publication of the H&V News Awards shortlist provided further good news for us with the £20m Guardbridge Biomass Energy Centre & District Heating network for the University of St Andrews being included in the Renewable Energy Project of the Year (Commercial/Non Residential) category. The Danish Embassy, which monitors contracts as part of its information service to Danish companies providing services to the UK, estimates that over half a billion pounds of public sector contracts have been awarded in the UK. Ian Manders, UK energy policy advisor at the Embassy, said: "Yet to appear in the figures are £2 billion plus of new heat network schemes that the UK and Scottish Governments are supporting. "You could say that district heating is booming in Britain." The Embassy said the estimates are conservative as market information on district heating is difficult to obtain as there is no central market place, although the UK Government publishes a report from time to time on heat network investment opportunities. Public sector schemes include social housing, city-centre and campus schemes. Last month the Building Engineering Services Association announced it will be tackling the "Achilles heel" of district heating networks by publishing a new standard the overall efficiency of schemes. 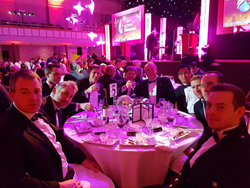 A large scale water source heatpump for one of the country’s largest district heating schemes received the runner up award for the prestigious ACR and Heat Pump Awards “HeatPump of the Year 2017” at last week’s awards ceremony in Birmingham. The innovative use of the heat pump in combination with other forms of low carbon technologies was described by the Award judges as “Star’s high temperature heatpump is a fine example of how products must evolve if we are to see heatpumps deployed across wider segments. We look forward to seeing more large heatpumps at next year’s event which is being held on the 18/01/2018 at The Titanic, Liverpool” Dave Pearson, director of Star Renewable Energy, accompanied by Jeremy Bungey, Head of Community Energy at E.ON, said. “We are very happy to receive this significant award. It demonstrates the versatility of heat pumps. The judges had an impossible situation given an excellent small heat pump and our large heatpump at 80C. Will we see you at Ecobuild 2017? The ukDEA in collaboration with Heat Networks Sustainability by Sweden and the Embassy of Denmark is delighted to invite you to the District Energy Event of 2017. In a UK first, we have come together to present the largest dedicated district energy exhibition ever held, at Ecobuild 2017. Whatever your interest is in district heating or cooling networks this is the place for you to connect with industry experts and discover more about this rapidly growing sector. Ola Nordgren, Energy Consultant and Head of Foreign Affairs, FVB Sverige ab. Start each day by taking a tour of the ExCel District Energy Centre kindly hosted by ExCel followed by a breakfast session at the District Energy Town Square hosted by Heat Networks - Sustainability by Sweden. Sheffield City Council is rolling out Switch2's smart energy prepayment meters to 5,800 homes connected to its heat network. This is predicted to reduce customers' total annual bill by £1.4 million, with the first 227 homes using the pay-as-you-go meters saving an average £238 each over the first year. The technology can be used for either prepayment or credit billing, but more than 80% of residents opted for prepayment to provide better budgeting control and because there is no price differential between the two payment types. Kirsty Lambert, Director of Switch2, said: "The heat network industry is pointing the way forward for the big six energy suppliers. Advanced smart metering has been available in our sector for a number of years. When implemented properly, prepayment tends to become the most popular, flexible choice. Customers can monitor and control their energy consumption, budget better and save money." The G6 smart pay-as-you-go unit was introduced by Switch2 in 2012, using wireless technology to replace the traditional corner shop/token based prepayment system with an instant top-up credit facility via the internet, smartphone app, phone, or any PayPoint location. The technology includes a graphical in-home display to show residents how much energy they are using - helping them to monitor and reduce consumption and save money. Switch2 has more than 35 years’ experience of smart metering and billing for the community energy and district heating sector. The company remotely manages and monitors its smart meters from its UK customer service centre, which offers complete billing and administration services. 09/02/2017: District Heating Heats Up in the U.K.